DONOR THANK-A-THON – September 27, 2016 « Central Florida Veterans Memorial Park Foundation, Inc. 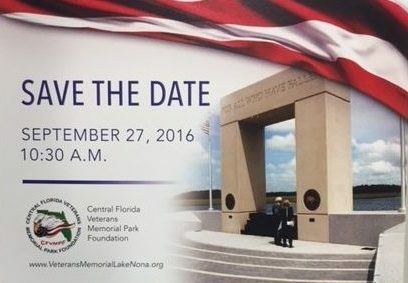 The Central Florida Memorial Park Foundation is pleased to announce a special event to be held on September 27, 2016 at 10:30 a.m. The “Donor Thank-A-Thon” event is to express our appreciation and to honor the many Donors that made the Memorial a reality through their generous contributions. Coffee/Danish will be provided by Panera Bread. This entry was posted on Monday, August 22nd, 2016 at 5:47 pm	and is filed under Uncategorized. You can follow any responses to this entry through the RSS 2.0 feed. Responses are currently closed, but you can trackback from your own site.